Among the most beautiful of all ‘Japanese Anemone’ or ‘Windflowers’, Anemone x hybrida ‘Whirlwind’ lives up to its name with petals that look ruffled, semi-double and quite large. These white flowers fill the late summer and autumn landscape with fresh, much-needed colour, and are superb for cutting. The flowers are daisy-shaped, with several layers of white petals, the petal edges ruffed and surrounding a bright yellow centre tinged with green. The flower stems reach up to 90cm tall. Very long-lasting on sturdy stems, they are a mainstay of the autumn scene. Anemone x hybrida ‘Whirlwind’ is a particularly free-flowering variety, thanks to its branching habit. Mature plants will fill in the available space, often spreading wider than the 60-90cm normally expected. Anemone x hybrida ‘Whirlwind’ is a perennial for cool conditions tolerates even quite wet conditions, and prefers a part shaded position. It is left alone by rabbits and even deer, and attracts the last butterflies of the season to its bright flowers. 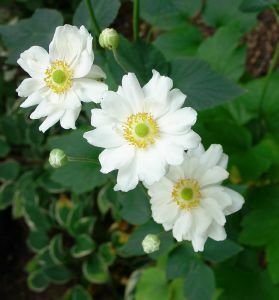 ‘Japanese Anemones’ thrive in full sun or partial shade and deep, rich, preferably moist soil. Once established, they will fill in any available space, though these plants are far too charming to be called invasive. For the purposes of definition, late summer flowering perennials may be described as plants that reliably produce flowers or that have as their main feature of interest (an architectural silhouette, or attractive seed heads for instance) which can positively contribute to the garden after midsummer’s day on a year in year out basis.